When I first started researching this episode I thought it would be a bit of a slam-dunk. Self-esteem is a good thing, right? I was really surprised to find that there’s little evidence that self-esteem helps children to do better in school, or even be happier, so there’s a good deal of disagreement among psychologists about whether encouraging self-esteem is necessarily a good thing. This episode digs into these issues to understand (as much as scientists currently can) the benefits of self-esteem – and what qualities parents might want to encourage in their children in place of self-esteem to enable better outcomes. It also touches on our self-esteem as parents – because don’t we all want to think that our child is just a little bit special, so we know we’re good parents? Bachman, J.G. & O’Malley, P.M. (1986). Self-concepts, self-esteem, and educational experiences: The frog pond revisited (again). Journal of Personality and Social Psychology 50, 35-46. Dweck, C. (2007). Mindset: The new psychology of success. New York: Ballantine. Forsyth, D.R., & Kerr, N.A. (1999, August). Are adaptive illusions adaptive? Poster presented at the annual meeting of the American Psychological Association, Boston, MA. Guindon, M.H. (2010). Self-esteem across the lifespan. New York: Routledge. Harter, S. (1993). Causes and consequences of low self-esteem in children and adolescents. In R.F. Baumeister (Ed. ), Self-esteem: The puzzle of low self-regard. New York: Plenum. Joslin, K.R. (1994). Positive parenting from A to Z. New York: Ballantine. Mruk, C.J. (2006). Self-esteem, research, theory, and practice (3rd Ed.). New York: Springer. 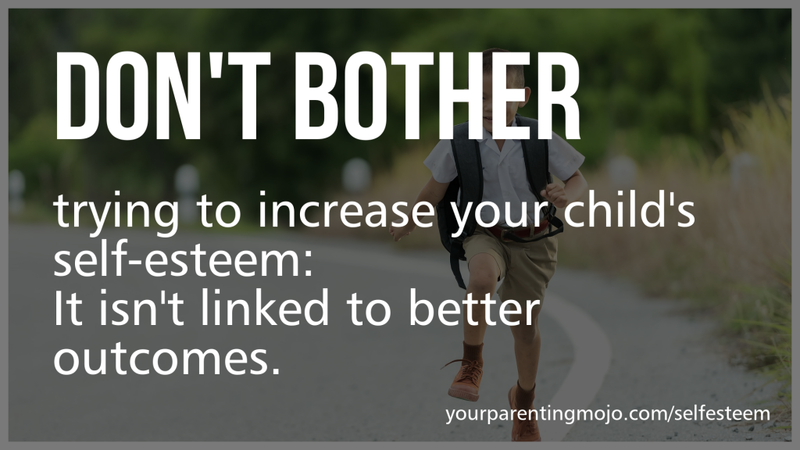 Hello and welcome to the Your Parenting Mojo podcast – today’s episode is about self-esteem. Now I have to say that when I first started researching this episode I thought it would be a bit of a slam-dunk. Self-esteem is a good thing, right? So I could find some studies talking about the detrimental effects of not having self-esteem, and some others talking about the benefits of having it, and conclude with studies on how to get more of it. It seems like virtually every article I found on this topic begins by citing an essay that the psychologist William James wrote in 1890 that purportedly describes what self-esteem is, and it is a bit dense: “So our self-feeling in this world depends entirely on what we back ourselves to be and do. It is determined by the ratio of our actualities to our supposed potentialities; a fraction of which our pretensions are the denominator and the numerator our success, thus: self-esteem = successes/pretentions. Such a fraction may be increased as well by diminishing the denominator as by increasing the numerator” – in other words, self-esteem increases when your successes are greater than your pretentions, and you can increase your successes or decrease your pretentions – or both – to increase your self-esteem. And it’s important that those successes be successes that are important to you – if you have “pretensions” of being good at something then it’ll be more important to you that you be successful in that arena than in a field that you know you don’t know much about. So for James, self-esteem is fundamentally related to competence, but other researchers see it as being related to worth, or value as a person, which introduces new things that can help us (for example, if self-esteem is an attitude then it can be measured) as well as things that make the definition more difficult (for example, it may be different in different cultures and we’d need to find out if any of the factors that make it up are found across all cultures). The most recent work puts these two together and say it’s about both competence and worthiness – we have a need to feel worthy and we achieve that need by feeling competent, so that’s the definition we’re going to go with for now, and we’ll have to live with some of the squishiness around self-esteem being related to two qualities, like the fact that it can be higher from one moment to the next or when the person thinks about one specific trait rather than another. So how do children develop self-esteem? An influential psychologist named Erik Erikson developed what he called a series of psychosocial stages that all people pass through as they go through their lives. It’s kind of like Freud’s psychosexual stages except Erickson focuses on our interactions with culture and society rather than Freud’s emphasis on the conflict between the id and the superego within the individual’s brain. Erikson says that our ego develops as it resolves crises that it goes through. The first stage runs from birth to about 18 months and is concerned with developing a trusting relationship with parents as the child resolves the trust vs. mistrust crisis – two other prominent psychologists, John Bowlby and Mary Ainsworth would call this the attachment relationship. The next stage is autonomy vs. shame which runs from 1 ½ to 3 years, where children develop physical skills – success results in autonomy, while failure results in shame and doubt. Between ages 3 and 5 children achieve greater independence and must resolve the initiative vs. guilt crisis as they take on self-directed activity and achieve a sense of direction and purpose. And between ages 5-12 children must resolve the industry vs. inferiority conflict by managing the demands of learning school-based and other skills to achieve a sense of competence or a sense of inferiority if they fail. There are other stages as well that are relevant to individuals in later stages of life but we’ll stop here for our purposes. As I read through these stages I could see how the ideas of competence and worthiness could be superimposed on each stage – as the individual goes through the stage (except maybe the first one) she receives signals about her competence and her need to feel worthy that are either positive and reinforce her competence and worthiness or are negative and undercut them. Very young children, between the ages of about three and five, can develop ideas about their strengths and things they find difficult, but they don’t generalize this to a global self-evaluation. Sometime between the ages of five and seven this generalization does occur, possibly as repeated successes, probably combined with parental encouragement to keep developing those skills, that becomes a self-fulfilling loop that promotes the development of self-esteem. One study noted that children are more likely to experience social success outside the family when three conditions are met – firstly they have an unwavering sense of acceptance by their family, second that they feel confident that they can meet age-appropriate expectations, and thirdly that they value their own autonomy. They compare their successes with those of friends and seek out friends who reinforce their self-esteem. This does seem to me to be a very western-centric definition of self-esteem – very focused on comparing oneself to others and being better than others in at least some domains. The majority of self-esteem research has been done on white children in North America, but it does make me wonder how children in cultures where this individual success is less important and may actually be frowned upon develop self-esteem – or if they do. A brand new study from 2016 actually measured self-esteem in five year-olds, which is something that hadn’t been done before because five year-olds don’t normally have the cognitive maturity or the vocabulary to discuss abstract concepts like the ‘self.’ Some researchers at the University of Washington set up an experiment where children were given flags to represent themselves (and some stickers representing the flags that they could take home after the experiment). They used flags because children understand what flags are; the fact that they used flags is sort of irrelevant, but it’s based on the idea that once you own something – whatever it is – you become associated with it. The children had to sort icons on a computer screen to state which flags on the computer were like their own flags, and then make associations between their own flags and “good” and “bad” flags. Overall children associated their own flags with “good” flags more than “bad” ones, meaning that they had fairly high self-esteem the researchers didn’t collect any other data about the children’s life circumstances that could help us to understand whether we should have expected this result in these or other children because their main objective was to see if it was even possible to test for self-esteem in five year-olds. So now we’ve determined what self-esteem is and that young children can have it, let’s talk about whether it’s a good thing. Perhaps it should come as no great surprise that my own home state of California actually led the charge in promoting the idea of self-esteem as a “social vaccine” – the state created a task force which released a report in 1990 that defined self-esteem rather more broadly than we have defined it: “appreciating my own worth and importance and having the character to be accountable for myself and to act responsibly toward others.” I have no quibbles with the first part of the definition, which is pretty much the one we’ve been working with, but being accountable and acting responsibly is much more in the interests of the state – which wants to increase social goods and reduce social ills – than any specific individual. The research report – which is available in full online; there’s a link in the references – say that low levels of self-esteem are linked to academic success, drug and alcohol abuse, crime and violence, poverty and chronic welfare dependency – all factors that cost the state an enormous amount of money. The study was based on a literature review, which means the researchers read a lot of books and papers by other authors, much like I did for this episode. But I should note that the average Your Parenting Mojo episode has a longer reference list than the average chapter in the task force report. The report’s authors also relied mostly on other reports and on books rather than original research papers. The reason I use so many journal articles in my references is because articles published in journals go through a peer review process, which means that probably three people not involved in the research read the article and try to make sure the methods make sense, that reasonable conclusions were reached, and so on. It’s not a foolproof system, but it is an extra layer of corroboration that doesn’t exist when you reference books and other reports. Perhaps it was inevitable that the pendulum would swing the other way. In 2003, Roy Baumeister and his colleagues published a 44-page literature review (which is really long, in the journal world) that contained almost five full pages of references, the vast majority of them original research published in peer-reviewed journals, which basically called into question all of the findings of the California Task Force report. Let’s go through the findings. Firstly, the link between violence and self—esteem is very unclear, because people who are narcissistic – that is, they have an inflated sense of their own self-importance – score highly on self-esteem measures. Some people with low self-esteem are violent, but so are some of the narcissists, which makes the non-narcissists with high self-esteem look bad. Some studies from the 1980s looking at prejudice found that people with low self-esteem expressed more negativity about people who weren’t like them than people with higher self-esteem. Then other researchers noticed that the low self-esteem people also expressed negativity about people who *were* like them – and once you they took that into account they could see that people with high self-esteem were actually more prejudiced toward people in other groups than people with low self-esteem. Several studies have looked at global self-esteem (so, the kind that’s not linked to a specific task) and its connection with attractiveness. It’s not hard to believe the results that self-esteem is mostly linked to how attractive a person thinks they are – one study found a correlation of 0.85, which is extremely high. But if we try to introduce a more objective assessment of assessing attractiveness than just asking people how attractive they are by having judges rate full-length photographs of the same people, the correlation between attractiveness and self-esteem dropped to 0.06. Photographs of just the individuals’ heads and shoulders fared slightly better with a correlation of 0.14, but then the researchers realized that people who were rated as more attractive were often wearing nice jewelry and clothes. Take those away, and the correlation dropped to precisely zero. So people with high self-esteem think they are attractive, even if other people don’t. Given our society’s focus on body weight you might also think there would be a high correlation between actual body weight and self-esteem. Just a quick primer on correlations in case you haven’t looked at a math textbook for a while: a correlation of 0 represents no alignment between two variables in question and -1 and 1 represent perfect correlations, the first negative and the second positive. It turns out that there is a correlation of about -0.24 between actual body weight and self-esteem, but there’s a much stronger link between how people rate their own weight and self-esteem – that correlation was -0.72. So people with high self-esteem are a bit thinner than the rest of us, but not by as much as they think. When we turn our attention from “normal” people to those with diagnosable eating disorders, we actually find quite a strong link between self-esteem and bulimia although again, we do not fully understand which causes which and so we don’t know that interventions to improve self-esteem can reduce the symptoms of bulimia. It seems that the combination of low self-esteem plus having perfectionist standards for yourself (i.e. a slim body) which you can’t possibly meet (exhibited by feeling overweight) is predictive of bulimic symptoms. One study found that teasing about an elementary school girl’s weight was more important than the girl’s actual weight in predicting self-esteem, and girls who were teased about their weight had lower self-esteem even if they believed the teasing had no effect on how they felt about themselves. This research implies that school-based efforts to improve self-esteem are likely to fall flat if they don’t address other causes of low self-esteem related to body weight like teasing. Let’s look at a topic that’s pretty important to us parents: the link between self-esteem and school performance. Since the California Task Force Report there has been a big push to increase self-esteem in school children so they will set higher aspirations for themselves and persist in the face of initial failure to learn new skills. Many studies have noted the correlation between self-esteem and school performance, but few have looked at the direction of causality – whether self-esteem causes higher academic performance or the academic performance causes improved self-esteem. A variety of studies have concluded that factors like socioeconomic background, IQ, and even race predict academic achievement and it is this which causes self-esteem. Many of these researchers have gone into their studies trying to prove that self-esteem causes academic achievement and came out the other side with a null finding. One study from 1986 even excluded African Americans from their all-male sample, since African Americans tended to score higher in self-esteem but lower in achievement. Even with their all-white sample, they still found that self-esteem had a negligible impact on eventual academic outcomes. Some researchers have tried to boost students’ self-esteem to improve their academic performance – one really nicely designed study singled out students who got low grades on a test and randomly assigned them to receive one of three emails from a professor containing either a test review question, a message aimed at improving the student’s responsibility for their own performance, or a message trying to boost their self-esteem. The students receiving the self-esteem message actually did worse on the next test, possibly because the message encouraged them to feel better about themselves regardless of the work they put in, which removed the motivation to work hard and resulted in lower test performance. Related to school performance, researchers have shown that people with high self-esteem persist with difficult tasks for longer than people with low self-esteem, even after an initial failure. They tend to persist when there’s no viable alternative goal to pursue, but they also quit earlier when an alternate potential goal can be pursued, which can be a good self-preservation strategy. This work also reminded me of Carol Dweck’s research on what she calls the Fixed Mindset and the Growth Mindset. Children with a fixed mindset believe they are born smart or stupid; there’s no point putting effort in because if you have ability, you shouldn’t need effort. Students in the fixed mindset don’t recover well from setbacks – as soon as the going gets tough, they consider quitting or cheating. It’s almost like their self-esteem has taken a huge hit from which they can’t recover. Students with a growth mindset look for new learning strategies to overcome initial failures, and these children ultimately outperform those with a fixed mindset. When we look at the role of self-esteem in interpersonal relationships, popular wisdom tells us that you have to love yourself before you can love others. But the science tells us otherwise – people with high self-esteem think they are more popular and socially skilled than others, but their peers actually don’t like these people better than anyone else. Children with low self-esteem might not have any friends, but it’s certainly possible that they have low self-esteem because they have few friends, and not the other way around. The few positive relationships we can see is that people with high self-esteem are more likely to initiate new relationships (as reported by their roommates, which we hope might be more reliable than the individuals’ own self-reports). People with high self-esteem are more likely to speak up when they disagree with the direction a group is taking, and are more likely to extract themselves from unhappy relationships. But the analyses of the social skills of people with high self-esteem is complicated by our friends the narcissists, who will score high for self-esteem and low for socially-positive behaviors. As we think about negative interpersonal relationships, the connections between self-esteem and violence, aggression, and antisocial tendencies are mixed at best. Ironically, an inflated self-esteem is associated with feeling good about yourself while engaging in socially undesirable behaviors, exactly the opposite of what the California Task Force aimed to achieve as it looked to achieve a collectively better society rather than one in which everyone looks out for themselves. Being happy is a goal for many people, and may also be a goal that parents have for their children. Happiness and self-esteem are indeed correlated, but we have no evidence regarding which causes which. Surprisingly, a variety of studies have found correlations between self-esteem and depression between 0.4 and 0.6; so these averages aren’t great. Low self-esteem may be one of a series of factors involved in depression, but by itself it is neither necessary nor sufficient to cause depression. There is some support for the buffer hypothesis, which is that self-esteem acts as a buffer in times of stressful events, but more research is needed to be sure. We also have to acknowledge that the only way to understand if people are happy is to ask them, which, as we know, is filled with the usual problems with the reliability of self-reported data. So, what are we as parents to conclude from all of this? I think we’ve thoroughly debunked my working hypothesis, which was that increasing self-esteem in children is unquestionably a desirable goal to pursue. We’ve seen that there is little evidence that self-esteem causes the host of positive outcomes that it’s commonly believed to cause. Fostering self-esteem doesn’t automatically lead to good outcomes – Baumeister points out that self-esteem feels good and fosters initiative, and Hitler had high self-esteem and plenty of initiative, and offered his followers self-esteem simply by being members of the so-called Master Race – hardly what we would view as ethical behavior. Baumeister says that the key seems to be that self-esteem results – and should result – from ethical behavior and worthy achievements – really worthy achievements, not just children doing what children do on a daily basis. Some parenting books today encourage parents to lavish inflated praise on their children: things like “Wonderful!” “You did an outstanding job!”, “You are terrific,” and “Perfect”!. There’s even a poster called “101 ways to praise a child” that advocates for the use of “Fantastic job!” “Excellent” and “That’s incredible!” – just google “101 ways to praise a child” and you can go and print one for yourself. But before you do, please do two things. Firstly, go back and listen to episode nine of Your Parenting Mojo which was called “Do you punish your child with rewards,” which delved deeply into the literature on how rewards – including verbal rewards exactly like the ones I just mentioned – are essentially just as harmful to your child as punishing him. Secondly, consider the results of one study I found which showed that adults are more likely to give inflated praise to children with low self-esteem than those with high self-esteem, both in a lab setting and outside of it. But inflated praise makes children with low self-esteem less likely to seek challenges – in this study, children were asked to complete a painting that would be assessed by an expert painter who provided one of three kinds of written feedback: “you made an incredibly beautiful drawing” or “you made a beautiful drawing” or a blank note with no writing on it. The children were then allowed to choose to draw a complex figurine, and the researchers told them they might make mistakes in their drawing but they’d learn a lot, or to draw an easier version, and were told that they wouldn’t make many mistakes, but they wouldn’t learn a lot either. Children with low self-esteem who received inflated praise were more likely to pick the easier drawing in the second test, although inflated praise prompted children with high self-esteem to choose to do a more challenging drawing – the researchers didn’t try to explain this finding among the high self-esteem children which goes against the majority of research on this topic. So the preponderance of the evidence suggests that not only is lavish praise harmful to “normal” children, it’s especially harmful to children who already have low self-esteem. If your child has low self-esteem what, if anything, should you do about it? I hope that by now we’ve debunked the notion that embarking on a course of excessive praise will meet your child’s need. A child’s self-esteem is actually not set in stone – researchers say that around a third to a half of older children and adolescents show significant changes in self-esteem over a one-year period, while others remain more stable. So it’s possible that changes could occur even if you do nothing. Going all the way back to William James, we understand that the two determinants of self-esteem are competence in areas that are important to the individual, and approval from significant others. Researchers have noticed that children who experience an increase in self-esteem often also see an increase in competence in subjects that are important to them, as well as more support from important people in their lives. Now we’ve seen that it may not be possible to impact self-esteem directly, but what we can do is help children to increase competence. We can give them tasks that they can do relatively easily and acknowledge their achievements when they complete them (again, not in an effusive way – just a simple “you did it by yourself” will suffice). Then we can increase the difficulty of the tasks, perhaps looking back to episode 5 of this podcast for help with what’s known as “scaffolding” of children’s abilities to complete new tasks. We can also encourage them to think of themselves as having abilities that they can modify through hard work, that are not inherent and static. So we can say something like “tying your shoelaces can be difficult when you’re just learning how. But trying to do it helps your brain to grow! Give it one more go, and if you can’t do it I’ll remind you how to do the first part.” This process of providing help and acknowledging competence provides the social support that children need to increase their self-esteem over time. We can also look for transitional opportunities which is when self-esteem is most likely to shift by itself, such as changes between schools or from school to college, because this changes three factors: firstly, changes in the child’s perception of competence, as there are new tasks to complete and new people to compare himself against, secondly the child may decide that new domains of expertise are important and the old ones are not, and thirdly new social networks will be established that can provide support. It’s certainly true that some factors can make it harder to take advantages of these shifts, including difficult temperament and a lack of natural abilities. And children with very very low self-esteem may be less able to recover than children with only moderately low self-esteem, so if you notice a downward slide it’s worth taking a look at this before it gets too bad. One researcher suggests that instead of promoting self-esteem, that we instead promote self-compassion, which entails treating yourself with kindness, recognizing shared humanity, and being mindful when you’re considering negative aspects about yourself. It is hypothesized that self-compassion might provide the same feel-good effect as self-esteem, but with fewer down-sides related to comparing yourself to others and needing to be better than them. Another advantage of self-compassion is that it is still helpful when self-esteem fails us – when we don’t do as well as we’d hoped, or as well as other people did, and we feel bad about it we can still be kind to ourselves. Researchers have noticed that people who lack self-compassion are more likely to have critical mothers, come from dysfunctional families, and display insecure attachment patterns, and that supportive mothers and family relationships with secure attachments predict later self-compassionate attitudes. The research literature I’ve found dances around this idea a bit, but I think that self-esteem plays a large role not just for children, but also for parents in their roles as parents. Most parents – me included – have the habit of looking around and seeing what other children are doing and whether that’s more or less than what our own child can do. We’re looking for evidence that our own child’s skills are superior to those of another child, because that will confirm our efficacy as parents and improve our own self-esteem. Yet when we find out that we’ve been doing things wrong, this self-esteem lands us flat on our faces. I’d like to elaborate on this for a minute with a personal example – I’ve mentioned elsewhere in this podcast that we use the Resources for Infant Educarers, or RIE approach to our daughter’s development – there’s more information about it in episode 000, on the philosophy behind the podcast. As soon as I found it I knew it was right for us; it is based in the idea of a respectful relationship between the parent and even the youngest of infants. But I didn’t discover it until my daughter was about four months old – which means that for four months I’d been interacting with her in what I now knew to be a very disrespectful way. I was lucky that I didn’t take too much of a hit to my self-esteem here, and that was because I self-admittedly knew nothing about parenting – going all the way back to William James’ definition of self-esteem, I had no pretention that I knew anything about parenting so it’s not like I suddenly thought of myself as a terrible parent because I sort of thought that all along. But I was very disappointed in myself for doing so much research before her birth on what the birth would be like and on having an exhaustive birth plan and not spending any time whatsoever thinking about what’s involved in raising a child. I felt a huge sense of loss at the months I’d spent interacting with her what I now knew to be not a very respectful way at all. But eventually I remembered what Maya Angelou advises: “I did then what I knew how to do. Now that I know better, I do better.” I treated myself with compassion, forgave myself for not knowing things I now believe to be important, and moved on with the best of intentions. It is my humble hope that if you discover things in this episode or other episodes of this podcast that you will treat yourself with compassion as well, acknowledging that you’ve been doing the best you could do with the information that you have, and if you choose to do things differently now to move forward with a positive intent. Perhaps this will help us all to be a bit more compassionate with ourselves and achieve the benefits to our happiness that self-compassion confers, without the drawbacks of superiority that come with self-esteem.